The first cookbook to be written and published by an African-American chef, this volume provides a glimpse into a bygone world. Born a slave in 1857, Rufus Estes became one of Chicago's finest chefs - working his way up from a Pullman Private Car attendant to a job preparing meals for the top brass at one of the country's largest steel corporations. While the heart of the book lies in mouth-watering recipes for such dishes as Creole-style chicken gumbo, chestnut stuffing with truffles, and cherry dumplings, the author also comments briefly on his Southern childhood. 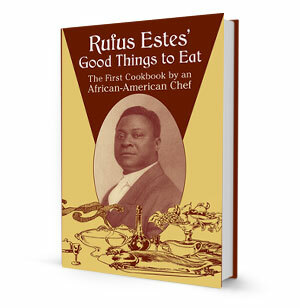 Rufus Estes' Good Things to Eat includes nearly 600 mouth-watering recipes: chicken gumbo, chestnut stuffing with truffles, cherry dumplings, southern style waffles, and scores of other dishes from haute cuisine to family-style meals. Delicious recipes and special significance for anyone interested in the African-American experience. This is a must-have for anyone with an interest in food history!